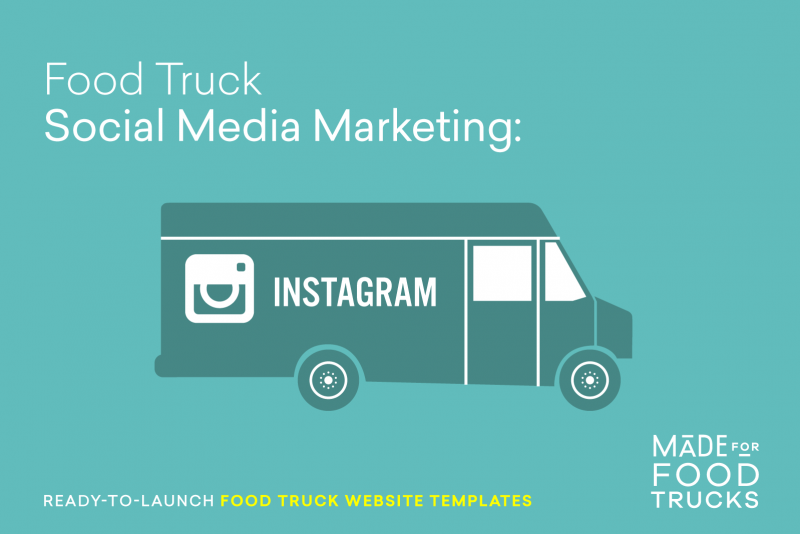 Whether or not your food truck is already driving the streets, coming up with a good social media marketing campaign is important to getting the word out about your product. 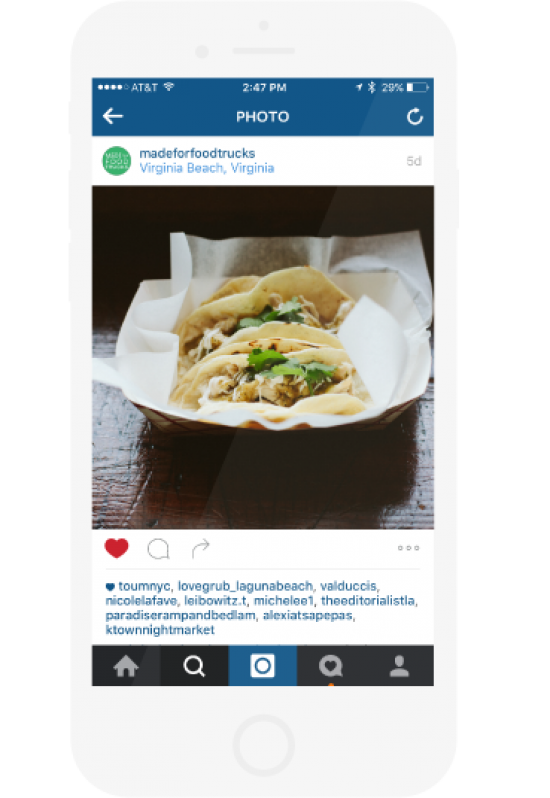 If you’re unsure where to start when it comes to food truck marketing, look no further than Instagram. Instagram is food truck marketing’s best friend. Where else can you put up post after post of deliciously enticing images to tempt your clientele to come out and eat? Here are just a handful of great ideas to get you rolling with Instagram. If you want to gain followers both real and virtual, giving away some of your food through social media marketing is a great way to do it. Post a picture of one of your most popular offerings, require Instagram users to both follow you and like (double-tap) the image, and then hold a drawing to see who wins. If one free meal can gain you hundreds, or even thousands, of new followers, this can be huge for you down the road as you grow your brand. Start early and build a following with freebies. 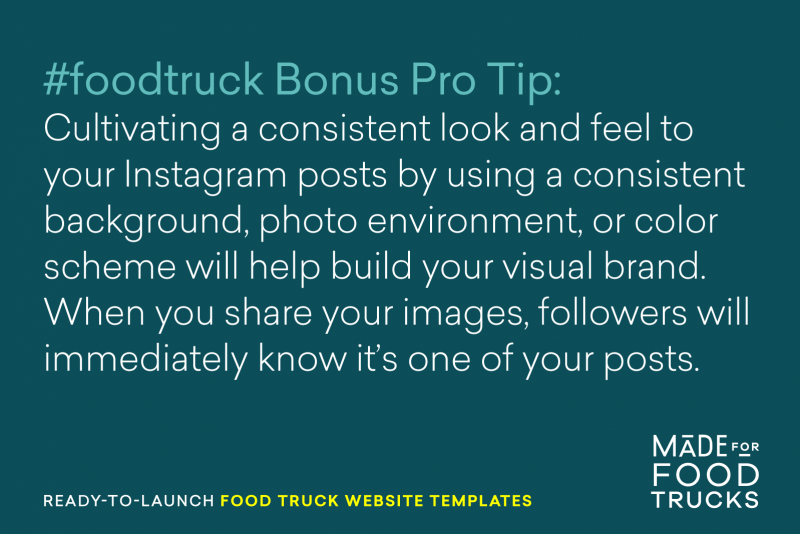 Devise hashtags that are specific to your brand and encourage your followers to Instagram their meals whenever they eat at your food truck. Using multiple hashtags can help increase your social media marketing reach. If your food truck Falasophy serves gourmet falafel and hummus, using both #falafel and #falasophy could help cross promote your business. Pair hashtags with giveaways for even greater reach. Running a weekly drawing for a free hummus bowl based on customers Instagramming with your hashtag is a great way of engaging them to promote your food truck to their network. In addition to Tweeting your whereabouts and posting on your own website, don’t forget to post an image to Instagram informing your customers of your food truck’s current location. If you’re parked down in the Chicago Loop in front of Willis Tower, snap a picture of the iconic building and tag it #chicagoloop and #willistower. Make sure to get your food truck in the image as well so potential customers know what you’re all about. This is a no-brainer but we’d be crazy to not list it here. People eat with their eyes and if you can post amazing pictures of your food truck’s fare, you’re going to entice your followers to come out and eat. You can even get your followers and customers involved and post images of them holding up your food, tagging them in the process thus sending your image to their own followers. Focus on the “social” in social media marketing and you’ll definitely succeed in getting your brand out there. You’re busy. If you’re not out in your food truck feeding the hungry populace, you’re probably in your kitchen preparing tomorrow’s ingredients. It can be difficult to manage your social media marketing while also running a business. You’re in luck, however, because apps like Hootsuite and Latergram.me allow you to setup and schedule your posts for a later time. You might be on the road at 8AM, heading to your favorite spot, but with these Instagram tools at your disposal you can be sure your message is getting out to your followers at the appropriate time. If you haven’t already, make sure you sign up for an free Instagram account right away and lock in your food truck’s name as your handle. The sooner you start building followers and interacting with them, the easier it will be for your brand to grow. Social media marketing doesn’t have to be scary, and Instagram is the perfect place for you to show off what you’re cooking. If you implement the techniques listed above, you’ll be light years ahead of your competition when it comes to food truck marketing. Even if you’re still in truck build out mode, an Instagram account is the perfect place to begin hyping your business. Build your brand with Instagram and show your followers what’s on the menu! You can find us @madeforfoodtrucks over at Instagram - check us out and we'll follow you back!